Symptoms of menopause usually begin in your early forties. Anything earlier than this is considered early menopause. Early menopause is not uncommon, and often occurs naturally, however it can also be caused by a variety of outside factors. Talking to your doctor and identifying what triggered premature menopause is the first step in dealing with the symptoms and consequences of premature menopause. There are a number of symptoms of early menopause, and they vary little from the symptoms of regular menopause. However, many of these symptoms overlap with symptoms of several more serious disorders, such as polycystic ovary syndrome, endometriosis, thyroid disorders, uterine cancer, and more. You can't assume that your symptoms are related to early menopause. If you are experiencing symptoms of early menopause, you should see a doctor for a proper diagnosis. Diagnosing early menopause takes time to confirm, especially in younger women where early menopause is often attributed to other causes. A good doctor will likely preform a battery of different tests testing for a variety of different problems. Diagnosing premature menopause involves a blood exam and estradiol test. After a physical exam, your doctor will draw blood to rule out any other conditions such as thyroid disease. The estradiol test, a test that measures estrogen levels, can indicate if your ovaries are starting to fail. Estradiol levels below 36 may signal that you're entering menopause. The most important test used to diagnose early menopause is a blood test that measures levels of follicle stimulating hormone (FSH). FSH helps your ovaries to produce estrogen. If production of estrogen slows down in the ovaries, FSH levels increase. FSH levels above 40 mIU per mL indicate menopause. If you have symptoms of early menopause, it's critical that you talk to your doctor as soon as possible to rule out more serious problems. Once your doctor has confirmed your diagnosis is early onset menopause, it's important to seek treatment to reduce long-term health risks such as osteoporosis and other problems associated with early menopause. 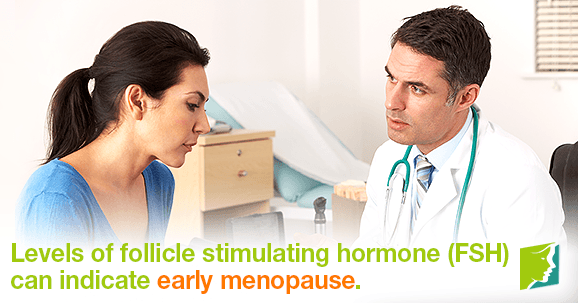 Click here to read more information about treatments for early menopause. If you are going through early menopause, you might not know why. This article explains early menopause and lists some of the hidden causes. When a woman experiences menopause too young, she is said to be experiencing early or premature menopause. Find basic information about this condition.